A heart transplant is an open-heart surgery in which a severely diseased or damaged heart is replaced with a healthy heart from a recently deceased person. It may be a treatment option for heart failure due to conditions such as coronary artery disease, cardiomyopathy, congenital heart disease or valve disease. Heart transplantation has made great strides over the years. Today, more than 85 percent of heart recipients will live at least an additional year and more than 70 percent will live five more years. However, patients continue to face a lengthy waiting list to receive a donor heart. Researchers are working to develop equipment to improve the health and comfort for patients waiting for a donor heart and, ideally, to develop a mechanical heart that could permanently solve the shortage problem. People who receive a heart transplant can expect to spend 10 days to two weeks in the hospital. The medical team will join them in the fight to keep the new heart free from infection or rejection by the body. After being discharged from the hospital, patients must continue to take their medications and keep follow-up appointments. There are many changes that come with having a new heart, and depression is not uncommon. The support of family and friends during this difficult time is an important part of recovery. A heart transplant is an open-heart surgery in which a severely diseased or damaged heart is replaced with a healthy heart from a recently deceased person. Heart transplants have been successfully performed since 1967. Unfortunately, the number of people waiting for a heart transplant is higher than the number of available organs. A patient generally becomes eligible for a heart transplant when diagnosed as having end-stage heart disease, all other medical interventions have failed and the patient is stable enough to sustain a major surgery. Coronary artery disease and cardiomyopathy are the most common heart conditions that may lead to a heart transplant. Other diseases include congenital heart disease (the most common reason for heart transplant in children), failure of a previous bypass or heart transplant and valvular heart disease. These conditions can lead to heart failure, in which the heart is unable to meet the body's demand for blood. Most heart transplant patients are white males, according to the American Heart Association. More than half are between the ages of 50 and 64, and about 20 percent are between the ages of 35 and 49. Primary pulmonary hypertension. High blood pressure in the blood vessels of the lungs. This is considered a contraindication for a straight heart transplant, making a lung transplant necessary. Eisenmenger syndrome. Any type of congenital heart disease that involves severe pulmonary hypertension. The condition accounts for nearly half of all heart-lung transplants. Cystic fibrosis. A genetic disease that causes thick mucus to build up in the lungs. Bronchiectasis. Destruction and widening of the lungs' large airways. Patients waiting for a donor heart will generally carry a pager and be "on call." When a suitable donor heart becomes available, the patient will be paged and told to come to the hospital immediately. If the donor heart is in the same hospital as the recipient, then the surgery will be done as soon as all preparations have been made. If the donor heart is being transported by ambulance or by air, then the surgical team responsible for the transfer will keep the hospital team informed of its progress. The hospital team will require about 20 minutes to prepare the donor for removal of the heart. Time is critical, because the donor heart can survive for only four to six hours outside the body. After arriving at the hospital, the patient will be given specific preoperative medications and prepped for surgery. First, the chest area is shaved (if necessary). Next, the surgical team creates a sterile environment by swabbing the patient's chest with an antiseptic solution and covering the area in sterile surgical drapes. An intravenous (IV) line will be started, usually in the forearm or back of the hand. When the time is right, the patient is given general anesthesia through the IV line. The patient will continue to breathe a mixture of oxygen and anesthetic gas to remain asleep throughout the surgery. After the patient is asleep, a device called the Swan-Ganz catheter may be inserted into the jugular vein in the neck. 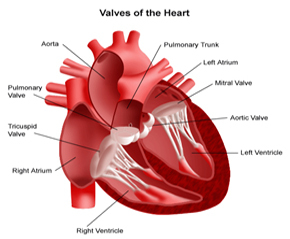 It is then threaded to the pulmonary artery, which transports blood from the heart to the lungs. The catheter measures heart function, pressures within the heart and lungs and oxygen levels within the blood. Medication is also delivered through the Swan-Ganz catheter. A breathing tube (endotracheal tube) will be inserted into the mouth and down the windpipe (trachea) to maintain an airway. 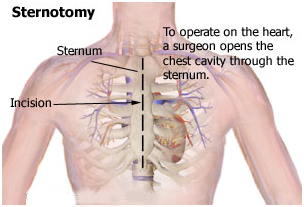 An incision is made through the chest and breastbone (sternum), and the ribs are separated. 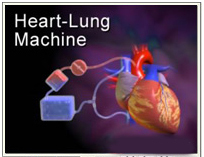 A heart-lung machine takes over the functions of the heart and lungs, freeing the heart from its normal function so that it can be removed. Some heart muscle is reserved during extraction to act as a support for the new heart as it is sewn into place. When the new heart is positioned and the blood vessels are reattached, the heart incision is closed, the heart is restarted and blood circulation and oxygen are restored. The warmth of the blood should "wake up" the heart and stimulate it to start beating. If this does not occur, it may be necessary to start the heart using an electric shock (defibrillation). 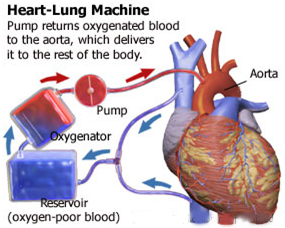 Once the blood is flowing through the new heart normally and without any leaks, the heart-lung machine is disconnected and the chest incision is closed. Continuous monitoring will follow the surgery. During this critical time, the cardiac surgeon, cardiologist and other members of the hospital staff will watch closely for any signs of heart rejection or infection. These are the two leading causes of death immediately after a heart transplant . Medications that suppress the body's natural immune system will be administered to counter the body's tendency to reject the new heart. These medications have dramatically reduced the number of rejections. Patients are unlikely to be very active in the next couple of days, but should be able to walk around in just three or four days. The total length of a hospital stay after a heart transplant is about 10 days to two weeks. Once patients are discharged from the hospital, the cardiologist and primary physician will provide regular medical support, including biopsies and other diagnostic tests several times a year. The new heart will beat significantly faster than the original heart and will not respond as promptly to increased physical stress (e.g., when exercising). This is because the new heart lacks the nerve connections that help a normal heart respond to changes in activity. There are many unexpected adjustments that may face heart transplant patients. Depression is not uncommon during this time, and the support of families and friends is very important. Most transplant centers have social workers and/or psychiatrists who can provide some assistance for heart transplant patients and their families. Even considering that patients are in a life-threatening situation at the time of transplant, about 87 percent of those who receive heart transplants survive for more than one year, according to the United Network for Organ Sharing (UNOS). Additionally, 73 percent live at least five years after the procedure. Today's heart transplant recipients live longer after surgery than those who received heart transplants just 10 years ago. Many transplant recipients return to work and many participate in moderately strenuous activities, such as walking, swimming and even running. Studies have shown that exercise is a valuable tool for recovery during the healing period and beyond. The improved life expectancy of patients after a heart transplant is largely due to immunosuppressive drugs, which reduce the body's tendency to reject the new organ. Rejection is a major risk associated with transplant surgery. When it occurs, the immune system sends out antibodies to destroy the new heart, which is perceived as foreign or "invading" tissues. Left unchecked, this rejection can result in extensive damage to, and imminent failure of, the transplanted heart. The many possible side effects of immunosuppressants include trembling, elevated cholesterol levels and elevated blood pressure (hypertension). Patients taking some immunupressants are cautioned to avoid grapefruit juice and grapefruit. This combination increases blood levels of the drug and can cause nausea, lightheadedness and abdominal pain. Biopsies to monitor the body's response to the transplanted heart tissue. This involves using a thin tube to remove a small piece of heart tissue. The tube is inserted through a vein either in the groin or side of the neck. Biopsies are outpatient procedures that can be performed in less than an hour. They are performed often in the first four months after transplantation and less frequently in the months and years after that. Blood tests (e.g., an enzyme test). Studies have found that the risk of transplant failure is three times greater among recipients with high levels of troponin I than those with normal levels of this enzyme. Patients can do much to monitor themselves, as some symptoms may signal rejection. Rejection, however, is not necessarily an irreversible event. In fact, cardiac transplant patients experience an average of two to three episodes of rejection in the first year after transplantation. Up to 80 percent of patients will experience at least one episode of rejection. It could be that a patient needs different doses or timing of medication. This is why it is recommended that patients immediately contact their transplant center or team should any of the above symptoms occur. When patients receive a new heart, they also receive new coronary arteries on the surface of that heart. Although these new coronary arteries may have less plaque buildup than their original coronary arteries, heart transplant recipients are more likely to develop coronary artery disease (CAD). This disease is thought to be part of the slow rejection process in the transplanted hearts. About 50 percent of heart transplant patients develop CAD. Therefore, patients must undergo a cardiac catheterization test periodically to check for the disease. Researchers have been investigating ways to lower the risks of CAD in transplant patients. In one study, 40 heart transplant patients were given daily doses of antioxidant vitamins C and E in addition to cholesterol-lowering statins. Results showed only minimal thickening in artery walls compared to greater thickening among patients taking only cholesterol drugs. Further studies involving a larger number of heart transplant patients will need to demonstrate similar outcomes before this treatment can be offered. Promising early results have also been seen with sirolimus, an immunosuppressive used since 1999 to help prevent kidney transplant rejection. In limited studies of human patients, sirolimus showed significant ability to slow down coronary artery disease. Organs are obtained from people who give their consent to have certain organs donated. They can also be obtained by permission of next of kin when a suitable donor is considered to be "brain dead." Although almost 40 percent of donated kidneys are surgically removed from living donors, most major organ donations (e.g., the heart, lungs, liver) are pledged while living and removed when the donor dies. Like most organs, the heart can be obtained only from donors who died a "brain death," meaning that the brain died while the body remains on life support. Donor hearts needn't always be perfect. For example, five-year results for people given hearts with mild-to-moderate left ventricular hypertrophy (LVH), a thickening of the main pumping chamber, were comparable to those who got hearts with no problems, according to recent research. Because of the great demand for organ donors, generally healthy people are strongly encouraged to become donors. To become a donor, individuals over the age of 18 can sign a donor card, provide instructions in a legal document or inform relatives that they wish to donate. Individuals should keep some indication of their willingness to donate on their persons at all times, such as in a wallet or purse , preferably in the form of a signed and witnessed donor card or, in some states, a donor indication on a driver's license.